Gavel in hand, Committee on Natural Resources Chairman Doc Hastings sits in an armchair flanked by the American flag and a bust of President Ronald Reagan. 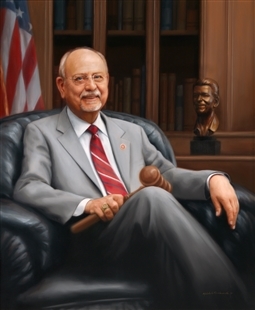 The inclusion of the bust comes as no surprise in this Washington State Congressman’s portrait, who attended the 1976 Republican National Convention as a Ronald Reagan delegate. Before chairing the Committee on Natural Resources for two terms, Hastings served as chairman for the Committee on Standards of Official Conduct.